Absolute Online Investment Auction — Harritt Group, Inc.
10% non-refundable down payment in the form of cash, check or wired funds is due within 24 hours following the auction with the signing of a legal binding purchase agreement. The cash balance of the purchase price will be due in 40 days. Real Estate taxes prorated to day of closing. Possession immediate at closing. Selling as is with no contingencies, all inspections welcomed prior to auction. Arts & Craft style bungalow in the heart of Old Clarksville selling online at absolute auction to the highest bidder without reserve. 1920’s 3 bedroom-2 bath 1 1/2 story home located off S. Clark Blvd. near Colgate Park just minutes to I-65. Arts & Craft style 1 1/2 story 3 bedroom – 2 bath bungalow built in 1926 with enclosed porch, unfinished basement, 20’ x 20’ carport and (2) utility sheds on 50’ x 140’ fenced corner lot with rear alley. Home includes family room with gas fireplace, sunroom, dining room with window seat, kitchen with back staircase, laundry/mud room with adjacent full bath and enclosed front porch on first floor plus three bedrooms and full bath up. Home features aluminum siding, high efficiency gas furnace, central air, some replacement windows and natural wood trim. 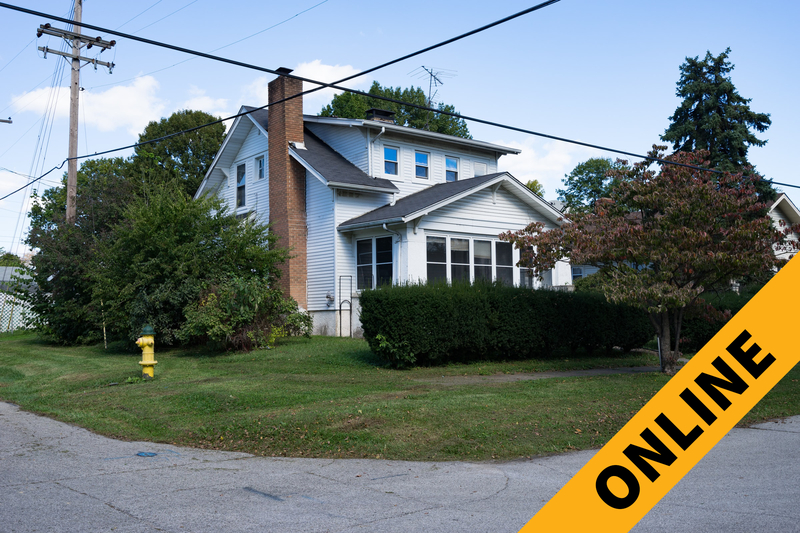 Located just minutes to Colgate Park, Aquatic Center, Falls of the Ohio State Park, Riverside Drive and I-65. Great potential, home needs renovations. Brown’s Station Way to South on Randolph Avenue to right on Harrison Avenue to left on S. Clark Blvd. 3/10 mile to right on Arlington at corner of Depauw Avenue.